In the fertile crescent of folklore, the fruit of knowledge is plucked. At that same moment, on the other side of the world, a rabbit named Joonie is born, nearly lifeless. Nurtured by the Sun and the Moon, Joonie must grow to understand his destiny while thundering clouds of change gather across the front range. 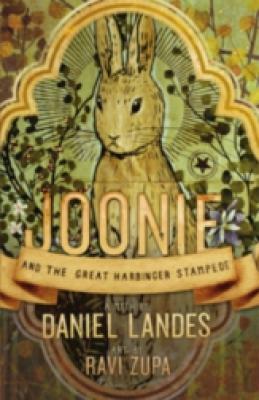 From author Daniel Landes and artist Ravi Zupa comes this beautiful myth of worlds in transition and the cataclysmic metamorphosis that threatens to consume all creatures in its wake-They are coming, and a lone rabbit must gather his courage and his friends to face the Great Harbinger Stampede. A writer in a restauranteur suit, Daniel Landes has published many short stories and even shorter poems. Some of his work has appeared online, but print is where he finds the most satisfaction. First things first. Daniel is the owner of Watercourse Foods and City, O' City in Denver, Colorado, and also Osa Mariposa restaurant in Puerto Escondido, Mexico. Over the years, Daniel has built a tremendous and successful business with these restaurants delivering the finest in vegan and vegetarian dishes to be found in the entire United States. His restaurants are considered to be a main attraction of anyone touring Denver, including the rich and famous that can be seen nightly at his wonderful establishments. Yet even though Daniel has poured his life into these restaurants, he has created a story so prolific and so profound that it wouldn't be a big surprise if it becomes not just a national best seller, but a movie adaptation made by Studio Ghibli! It's called Joonie and the Great Harbringer Stampede. The story is about an unlikely hero that was born "into tumultuous times," according to Daniel. This hero happens to be a rabbit who is being heralded as a "runner" and who has the unforgiving mission of stopping the great Iam from overtaking the world. Confused yet? One read and you'll see why this is essential reading for our times, as it's not just about a rabbit but about the beginning consciousness.